Lean Plate Club blogger Sally Squires says the list of health benefits from regularly eating apples is wide, and ranges from helping with weight loss to improving the immune system and improving heart health to promoting more healthy gut bacteria. WASHINGTON — We’ve heard it many, many times: “An apple a day keeps the doctor away.” But is that really true? Sally Squires, who writes the Lean Plate Club™ blog, says there’s a long history to the phrase — it began in the 19th century in Wales. And studies have shown it’s based in fact — apples are good for us. “It’s one of those great pieces of fruit that we simply don’t get enough of,” Squires said. The list of health benefits from regularly eating apples is wide, and ranges from helping with weight loss to improving the immune system and improving heart health to promoting more healthy gut bacteria. “We’ve known for a while that apples are good for cardiovascular health, but we’re also learning that some apples, such as Granny Smith apples, seem to be extremely beneficial in promoting healthy gut bacteria for us to be at our optimum health,” Squires said. Encouragingly for parents and young kids, studies are also finding that pregnant women who eat two apples daily have kids who are much less likely to have asthma by age 5 than those mothers who didn’t regularly eat apples. 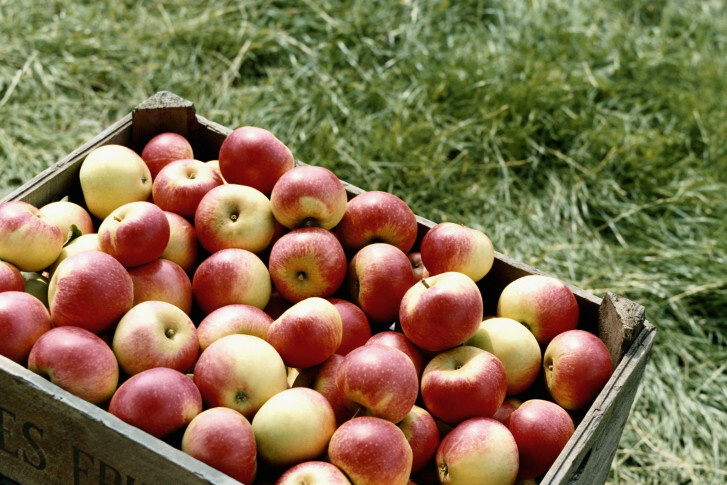 Apples are also rich in antioxidants that help protect against inflammation and cancer. But don’t discard that peel! It has most of the fruit’s antioxidants. Squires added that the best time of the year to enjoy locally-grown apples has just begun, and runs through for the next couple of months. She said nearly 240 million bushels of apples are grown domestically each year, with most coming from 10 apple-producing states, including Virginia. The top apple varieties are Red Delicious, Gala, Granny Smith, Fuji, Golden Delicious, Honeycrisp, McIntosh, Rome, Empire and Pink Lady.